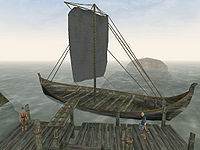 Khuul is a small fishing village in the West Gash region of Vvardenfell, on the island's northern coast. Aside from a single Redoran-style shell-house, which serves as a Tradehouse, the buildings are all rustic huts made of logs, rough planks and thatch. The only other legitimate businesses near Khuul are two egg mines–the Panud Egg Mine, just outside town, and the Asha-Ahhe Egg Mine, far to the southwest. 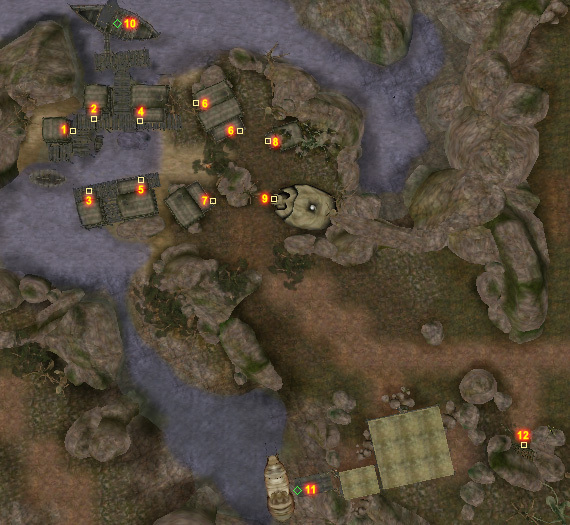 There is also a silt strider port just south of town, by the Panud Egg Mine. Khuul has always been rumored to be a smuggling town, but the residents have never confirmed nor denied this. They are suspicious of strangers asking a lot of questions and don't like people poking around. There is one merchant in town who spends most of his time at the tavern and two shipmasters who presumably share the single seagoing vessel moored at their dock. In Thongar's Tradehouse, Thongar is the local general trader who does not rent beds, contrarily to what many townfolk claim. Ondi offers training. There are two Egg Mines just south of Khuul, one of which has troubles with a witch. Drethan can take you to Gnaar Mok and Dagon Fel on his ship, the Omenwedur. The Silt Strider on the south road can take you to Maar Gan, Ald'ruhn and Gnisis. A dirt trail leads southwest to Ald Velothi and Gnisis. If you have the Bloodmoon expansion, the Khajiit S'virr can transport you to Fort Frostmoth in Solstheim. Northwest of Khuul is a tiny island with a waterfall and a campfire. There are some Thieves Tools, a Pilgrim's Lantern and a few locked chests. Alen Ancestral Tomb has vampires of the Quarra bloodline. The clan's headquarters is east of Khuul in Druscashti. The Daedric Shrine of Ashalmawia.